Summer is here and there’s no better way to spend the day with your children than by doing something outside. 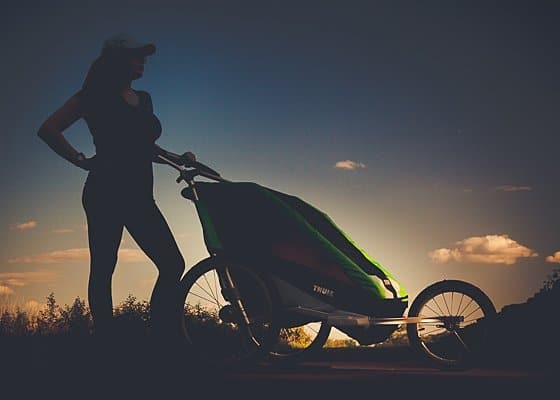 Whether you enjoy leisurely strolls through the park, hikes through the woods, training for marathons, or being on the back of a bike, the Chariot Cheetah by Thule is the stroller for the active family. And when winter rolls around, you can even take your kids cross-country skiing! Take a look at some of the features of the double version of this rugged, all-season stroller below. Who is the Chariot Cheetah 2 For? 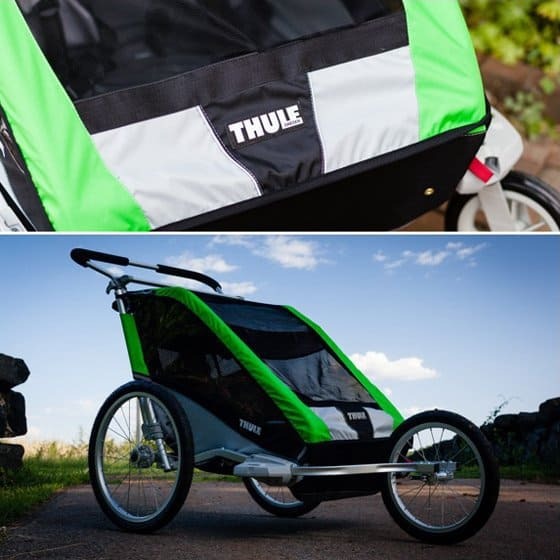 Ready To Explore The Outdoors With Thule? 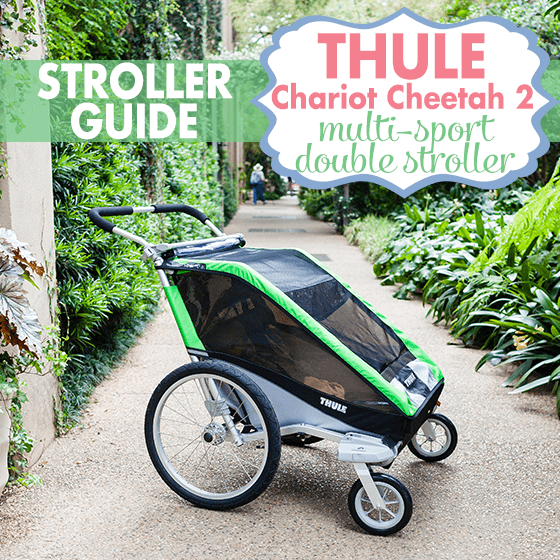 The Chariot Cheetah 2 by Thule is a lightweight multi-sport double stroller perfect for active families that don’t want to leave their kids behind. 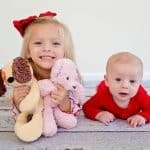 The double is great for families with two children as well as for those planning to expand their clan. 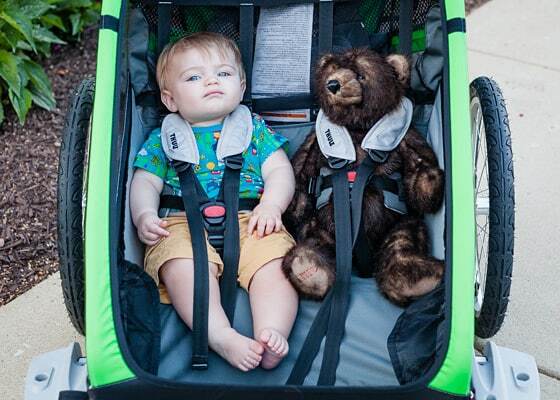 The stroller can accommodate up to 100lbs combined, so you can bring along both younger and older kids. For strolling with very young babies, an infant sling is available for added support. A single version, the Thule Chariot Cheetah 1, is also available and shares many of the same great features. 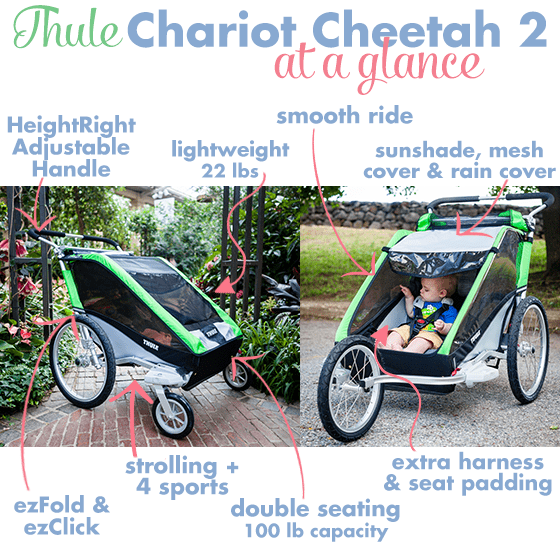 The Chariot Cheetah 2 adapts to your family. 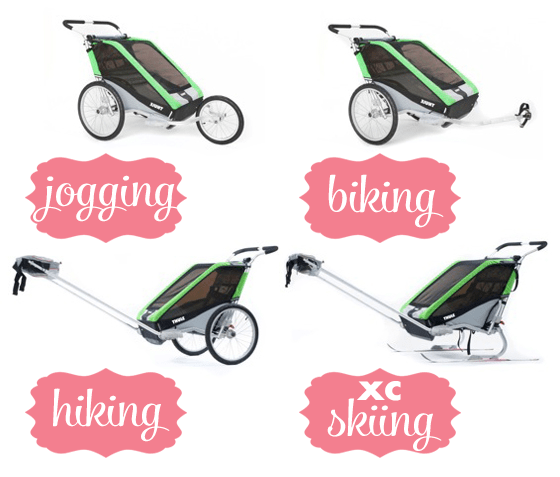 The stroller can accommodate whatever your sport of choice: walking, jogging, biking, hiking, or cross-country skiing! 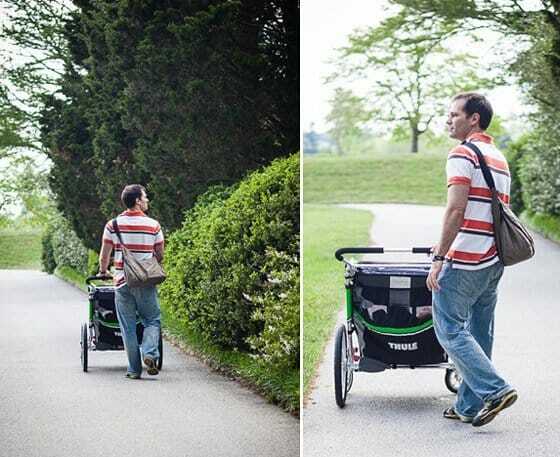 With the strolling kit, you can use it as your everyday stroller for walking around the park and other family outings. 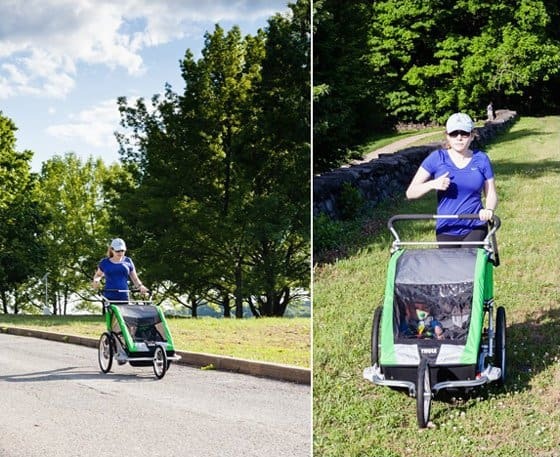 The jogging kit converts your stroller into a high performance sports stroller that lets you bring your kids along for the run. 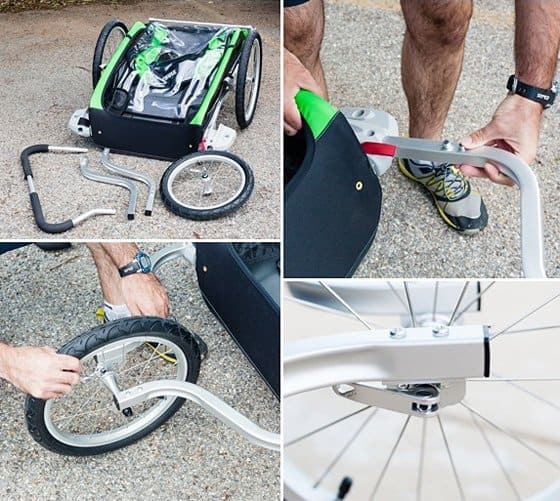 Hitch the stroller onto the back of your bike with the trailer kit, or attach tow bars to even take your children hiking or cross-country skiing. All the kits link up to Thule's VersaWings to make changing kits fast and simple. Lightweight & easy folding: The Chariot Cheetah 2 is aerodynamically designed and lightweight. 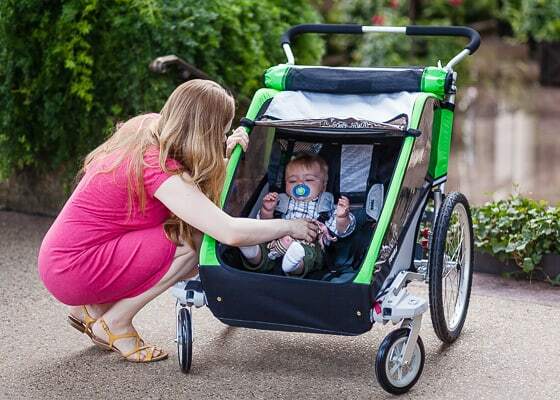 With it’s aluminum frame, the stroller weighs in at just 22lbs. 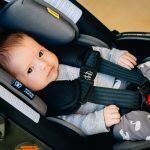 Thule’s VersaWing and ezClick design make changing out kits quick and easy, and with the ezFold design, collapsing the stroller is a cinch. 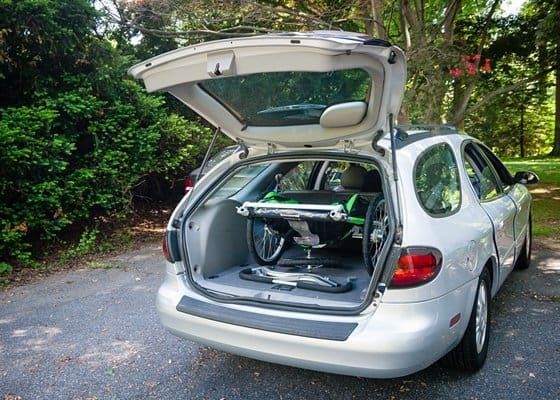 Performance: Thule’s Chariot Cheetah 2 rides incredibly smoothly. It has a light touch and feels almost effortless to push. 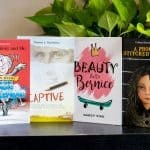 In fact, it’s such a pleasure to push that you’ll be inspired to take an even longer walk (or jog)! The Chariot Cheetah is extremely easy to maneuver and you can easily steer with one hand. Quick-release wheels: The front strolling wheels click in and out of the VersaWings in seconds. The rear wheels detach with a quick push of a button so you can remove them in a pinch when you need to pack up the stroller. 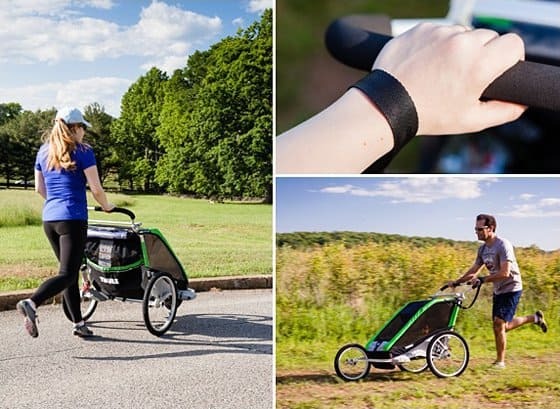 Adjustable handlebar: The handlebar can be adjusted to accommodate the height of the user, which is a must-have feature if both mom and dad plan to use the stroller. The handlebar can be changed between two positions by simply removing it, turning it over, and clicking it back into place. It’s also covered with a soft but firm material for comfortable gripping. 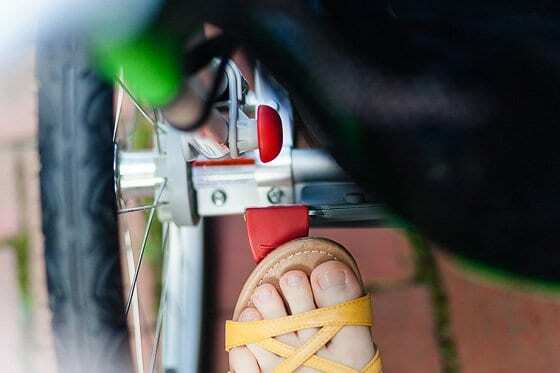 Parking brake: The brake is easy to engage with your foot when you need to park the stroller securely on a flat surface and just as easy to disengage when you’re ready to go again. 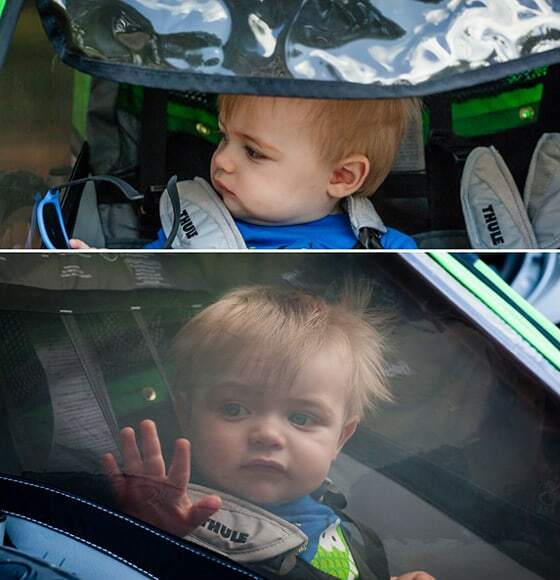 Reflective material: Reflective and luminescent material helps keep the stroller visible at night. 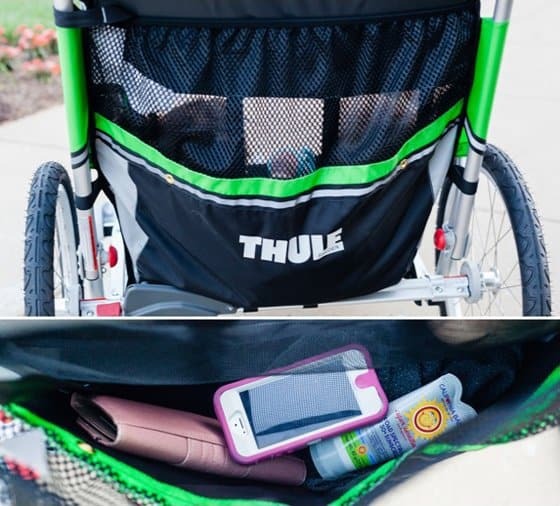 Storage & accessory bar: The stroller includes a rear cargo pocket to store your belongings which holds up to 8.8lbs. There are also two interior mesh pockets in the child cockpit. An accessory bar for mounting add-ons can transport an additional 5lbs (see below). 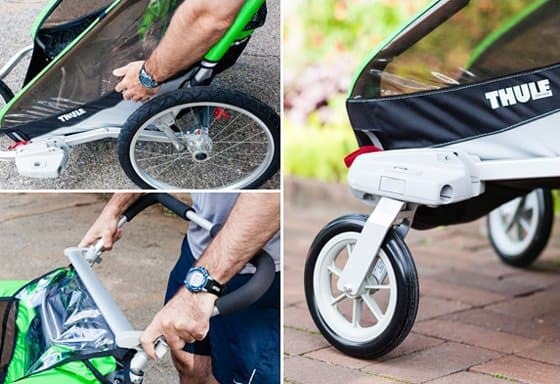 The jogging conversion kit consists of a jogging wheel and two aluminum arms that click into the VersaWings on the stroller chassis. 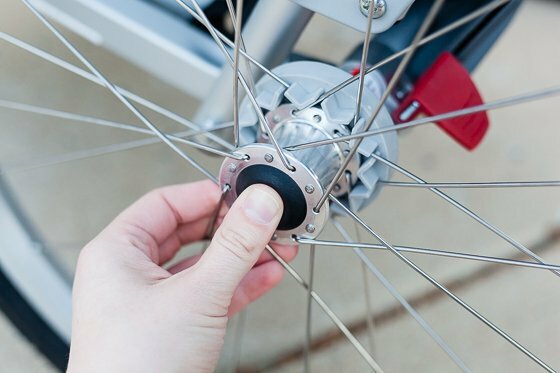 The jogging wheel features a quick-release lever to easily mount and unmount the wheel. Setting the stroller up for jogging and disassembling it when you’re finished is a snap! 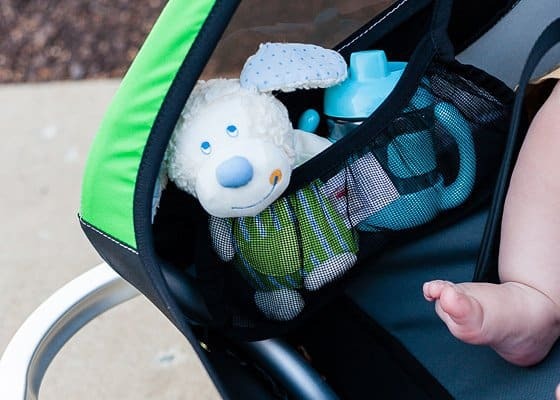 A safety wrist strap is securely affixed on the left side of the stroller to keep the stroller from accidentally getting away from you. As in strolling mode, the Chariot Cheetah 2 as a jogging stroller excels when it comes to performance. It rides smoothly not only on paved surfaces but jogging terrains as well. 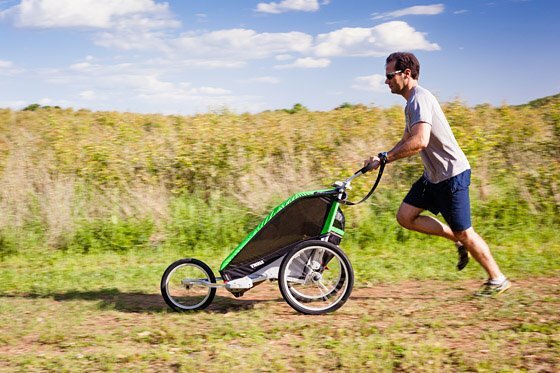 If you like trail runs, then a smooth ride is what you and your children need and the Chariot Cheetah 2 delivers. 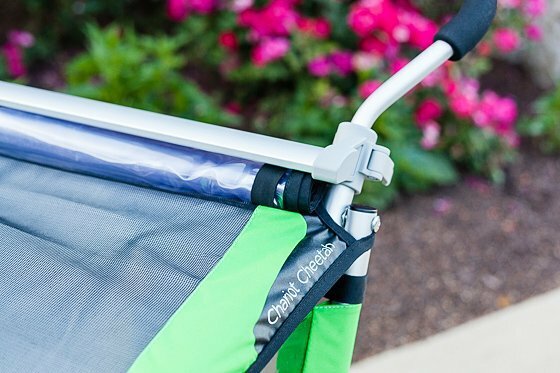 The locked wheel makes the Chariot Cheetah 2 a true jogging stroller and helps keep the stroller going straight with little effort on your part. Comfort & safety: A 5-point child safety harness keeps your children safe and secured. 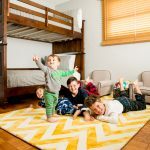 The harness has plenty of play to accommodate various sized kids. Extra padding on the harness and the seats keep your children comfortable even when you’re off-roading it. The upper seat back features mesh for enhanced airflow to keep your children cool on hot days. Roomy cockpit: With a pass-through width of 31.5 inches, the Chariot Cheetah 2 is definitely wide but is, after all, a double stroller (and it does fit through standard interior sized door frames). The stroller’s size means the child cockpit is roomy and kids will appreciate the space, especially on long outings. The Chariot Cheetah 2 offers integrated helmet space so on bike rides kids still have plenty of head room while wearing a helmet. 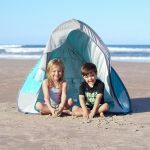 Sunshade & large windows: A sunshade keeps the bright sun out of your kids’ eyes. 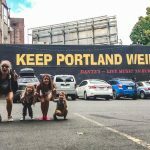 This is particularly useful for babies who refuse to wear their sunglasses! (It can be rolled up out of the way on cloudy days). The side windows are tinted to provide all-around shade from the bright sun. 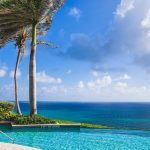 Babies and children alike will also appreciate the large size of the windows so they can enjoy the scenery and not miss a beat! 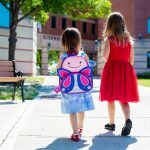 Two-in-one weather cover: If you enjoy a light jog in a Spring shower, or just find yourself caught in a sudden rainstorm, the plastic weather cover has your children covered (literally)! The cover is secured easily on both sides at the bottom with double-sided velcro. 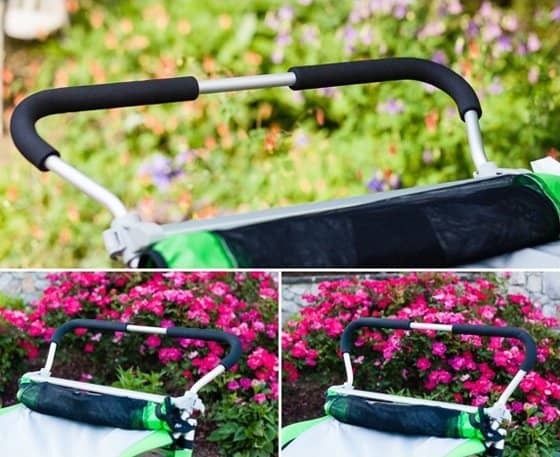 When the rain has passed, simply roll the cover up and attach with the elastic loops on each side at the top of the stroller to keep it neatly out of the way. 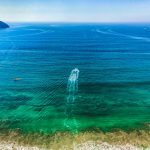 A mesh cover layered underneath the plastic cover can be rolled down to protect from the elements (wind and bugs) while still allowing air flow. If you don’t need a cover at all, simply roll the mesh layer up as well and secure with the loops. Interior pockets: Mesh pockets in the child cockpit on either side offer a great place to store your kids' belongings such as sippy cups, snacks, or toys. 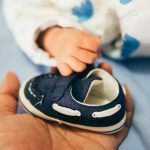 Check out our other stroller guides to find something that fits your family!